Microsoft has recently published more details on the licensing of Windows Server 2016 and System Center 2016 products. The publications are general available (and probably they will not change in the RTM) and are composed by a licensing FAQ, as well as a Windows Server 2016 Datacenter and Standard Edition licensing datasheet and a System Center 2016 licensing datasheet. Note: Other editions will also be available with more information coming in 2016. As you can notice the core functions remain the same, but now there are several functions available only in the datacenter. Storage Space Direct will also fall in this category of specific functions. The fact that the storage functions will be available only with the datacenter edition it’s a pity, that can limit the adoption of the Scale-Out FileServer (that now my require a Datacenter edition). Or will simply increase the hyper-converged approach (using the Storage Space Direct with Hyper-V on each node). But the big change is that the licensing of Windows Server 2016 Standard and Datacenter editions will now shift to be based on physical cores from the prior licensing model based on processors! 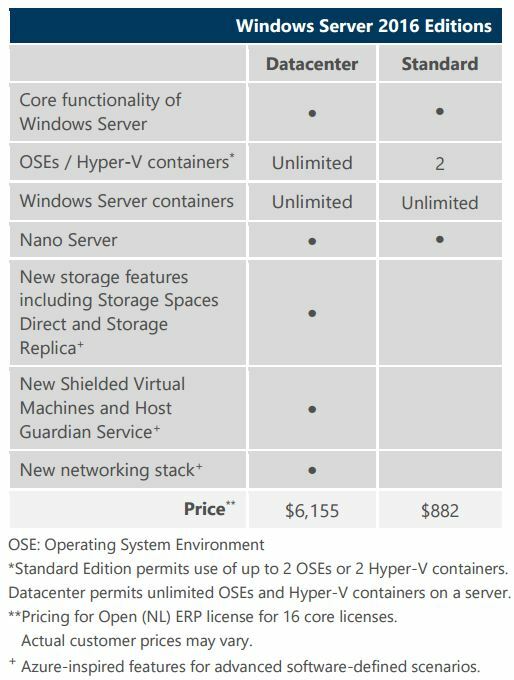 Note that the price of 16-core licenses of Windows Server 2016 Datacenter and Standard Edition will be same price as the 2 proc license of the corresponding editions of the Windows Server 2012 R2 version. With more than 16 cores you will have more costs (double or more!) to consider per host. Of course you can turn off some core from the BIOS (in most server there is this option), but this should be a last option. Considering that now the minimum two socket is no longer required, it’s also possible use single processor with 16 (or less core), instead of two with 8 cores. This license will still work. Other options may be not so interesting (if you want to minimize the costs). Unless Microsoft will change the licensing, new design practices will become common with the latest version of Windows Server and not only for Hyper-V environment, but for all virtualized environment with Windows Server based VMs. Another interesting news is the support of “hybrid cloud” moves: an “Azure benefit” that lets organization move their Windows server licenses with Software Assurance to the Azure cloud computing infrastructure. These organizations can “upload their Windows images to Azure and pay only the compute rates,” according to the FAQ. The benefit entitles customers to run up to 2 instances on up to 8 cores each or 1 instance on up to 16 cores in Azure for each Windows Server Standard or Datacenter 2 proc license with SA. When the benefit is used on Windows Server Standard Edition licenses with SA, the Standard Edition license can no longer be assigned to another server. When the benefit is used on Windows Server Datacenter Edition licenses with SA, the customer can continue to assign and use their Datacenter Edition licenses for unlimited virtualization on premises.